Barely six months after donating set of classrooms, three offices and furniture to St. John's Primary School under its Adopt-A-School initiative, the leading telecoms services provider Airtel, has taken a step further by donating a borehole and some educational material to pupils of the school. The donation which include school uniforms, bags, text books, note books and other materials were donated by to the school by Airtel on Thursday 21st November as part of its Corporate Social Responsibility and its commitment to the development of education in Nigeria. Speaking at the handing over of the borehole and presentation of the gifts to the pupils and staff of St. John's Primary School, Oke-Agbo, Ijebu Igbo, Ogun State, the Chief Executive Officer, Airtel Nigeria, Mr Segun Ogunsanya, said the provision of safe and clean drinking water for the pupils and their teachers would keep the children within the school compound during school and also prevent them from water borne diseases. The CEO who was represented by the Regional Operations Director, Bayo Osinowo, noted that Airtel in all its activities has continued to strive not only in “providing world class telecommunications experience for customers, but also endeavour to support the social, economic development of communities in which it operates. This is the reason we here today officially hand over this borehole to the school authority. “In Airtel, we are passionately committed to partnering with organisations to improve the society. 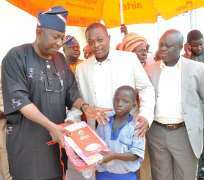 That is why our CSR initiative is committed to adoption of government owned primary schools nationwide,” he said. He also recalled that six month ago, her Excellency, Mr Olufunso Amosun, wife of the state governor, commissioned a block of 4 classrooms and offices fully furnished with desks, tables and electrical appliances. He promised that Airtel will continue to look after the school and pupils saying, the telecoms operator has come to stay. In his address Barr. John Olusegun Odubela, the Commissioner of Education, Ogun State commended the telecom operator for donating the borehole and educational materials to the school, saying the initiative was a laudable gesture which will make indelible impression on the school, pupils and the community. He noted that the partnership of Airtel with the Ogun State Universal Basic Education Board has contributed to the development of education sector in the state. The commissioner commended Airtel in brining public and primary school, especially those in remote locations at par with the best run private schools in terms of infrastructure and academic performance, for the benefit of the less privilege children. He implored the pupils to justify the huge financial investment by making the best use of the opportunity afforded them through this unique gesture and by aspiring to greater academic excellence and good behaviour. He also implored all stakeholders to team up in ensuring that the school is taken to higher pedestal thus becoming a pride to the community and the state. The Head Teacher of the school, Mr Adewale Azeez Oladele, appreciated the initiative of Airtel to deem it fit to improve the facilities in the school and also encourage the pupils through the provision of the borehole and educational materials. He also used the occasion to encourage Airtel further assist the pupils by renovating other old classrooms. He noted parents now feel inclined to enrol their children in the school. Mr Felix Banjo, Chairman of Parents-Teachers Association (PTA) recalled that before the adoption of the school by Airtel, the pupils lacked good classrooms, drinkable water and other basic needs, “ but ever since Airtel started catering for the pupils and teachers things have changed for the better. And our children now learn with ease as a result of the support of Airtel. With this borehole, there is no more buying of sachet water. We really thank Airtel for this borehole and other gifts. After the cutting of the ribbon by the commissioner, Airtel representatives, parents, teachers, pupils and other guests at the occasion drank water from the borehole. The commissioner also presented books, bags and uniforms to the pupils. The event was attended by Airtel's Zonal Business Manager, Akinloye Adebisi; Area Business Manager, Lagos North, Akinsola Omoniyi; Trade Marketing Manager, Lagos North, Lynda Muibi; the Education Officer, Ifako-Ijaye LG, Lagos, Ojuade, Oluwaseun alongside dignitaries and stakeholders in the education sector such as the Chairman, State Universal Education Board (SUBEB), Mr Mufutau Ajibopla; the Director of Education, Primary, Secondary and Tertiary Education, Mr Adekunle Adegbesan and scores of parents from the community.